Raccoons Rags: More work from my lovely customers. 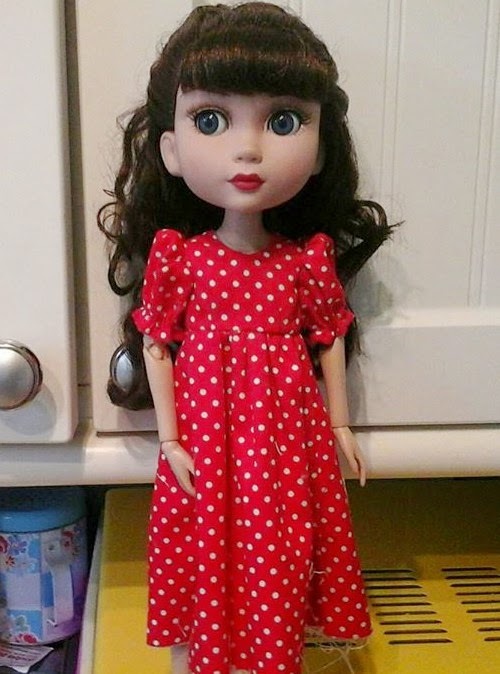 I love when people show their sewing from my patterns, and it's also nice to see other folks dollies. So I've posted these little cuties to show what people are making. This first is pattern SSP-007, the dungarees & leotard pattern, sewed by the lovely tillietogs over on Flickr. Her lil' gal has a wonky eye so she even has a matching eyepatch. I love the knits and crochet she adds to the outfits. 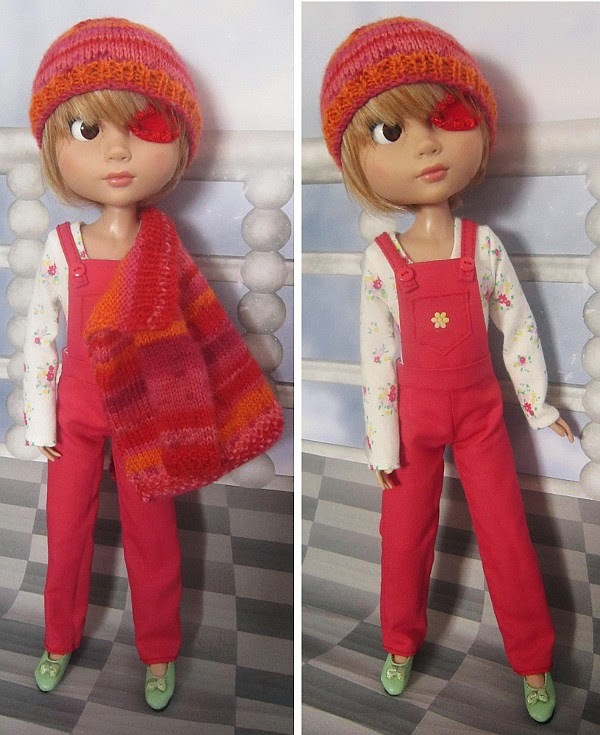 Next are a couple of versions of the pinafore & dress, pattern SSP-005. This first is by Julie, over on Facebook. I love the foxy fabric, and the hat! And finally a lovely red dress for Patience, again pattern SSP-005, made by Debbie, also on Facebook. As for me, I'm working on an Ellowyne Wilde version of the Posh Frock pattern for Patience, (SSP-004) one of my favourites, and my model, Pris, is looking very lovely already. I'll show pictures on publishing day. Lovely dresses and Zsa Zsa is very excited to be appearing on your blog!! The Ells are looking forward to the Posh pattern!!! She's a smash hit, lol! The pattern is nearly ready. I couldn't finish it today as I went to visit my lovely dad - which meant leaving the house for HOURS on end, but it was so nice to see him. :) I'll draft up the pattern pieces and hopefully publish tomorrow. I hope people like green... I'm nervous the colour might make people not buy it. Well it won't stop me buying... whilst I love the fabric you've used I'm more of a summer colours kind of girl... I always go for sweet pea colours... kind of the same colours I'd wear myself....I'm not a big fan of green but it wouldn't put me off... silly peeps if it does as your patterns are fab!